TULSA, Okla. — With the first chance for severe weather on Wednesday, knowing what to do in your home when severe weather hits is crucial. 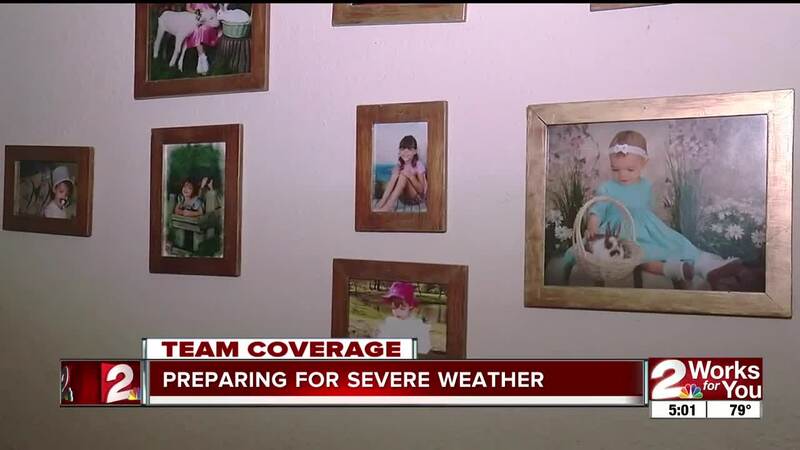 Tulsa resident Bud Taha grew up in Oklahoma and understands the importance of making sure he and his family are weather aware and have a plan. “You never know when it’s going to hit you or where it’s going to hit you," Taha said. "We see them every year in Oklahoma. I mean, the Catoosa tornado in the 90s that killed several people. The awful Moore tornado a few years ago." That’s why the National Weather Service said sheltering underground is the best thing you can do, but if you don’t have a cellar or basement, there are other options. Taha said his now-eenage daughter has known their safe place since she was a little girl. “She’s like, ‘Dad, where do we go in our house?’ I said , 'your bathroom. She asks, ‘Why my bathroom?’ Because it’s a safe room. it’s got two closets and a room behind it," Taha said. If you’re going to use the bathtub as shelter, it’s important to have as much cushion around you as possible, like blankets and pillows. This way it will protect you from any falling debris. But it's not always the best option, if the bathroom is next to the exterior wall. The hallway can be another option for sheltering in place, as long as it’s on the inside of the home and away from any windows. In the event the power goes out during a storm, it’s a good idea to have a portable radio or phone charger on hand. This way you can always stay connected to weather experts to know when it’s safe. Taha said it’s best to just be prepared for anything. "At least have a plan," he said. "You may never use it, but have a plan."